The Excel Add-In MTools is a powerful software, that fills the gaps in Excel and leverages the efficiency of your daily work by automating frequently used tasks and processes. I work in a controlling department of an international company and therefore know the needs and wants of business people. The focus of this Add-In is to deliver powerful utilities in a simple and clearly represented way. For security reasons, you should also check out the MTools Excel AddIn download at LO4D.com which includes virus and malware tests. Additional screenshots of this application download may be available, too. 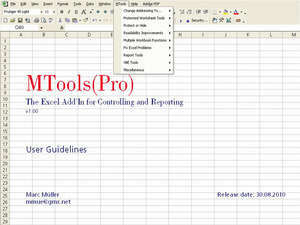 MTools Excel AddIn has a presence on social networks.